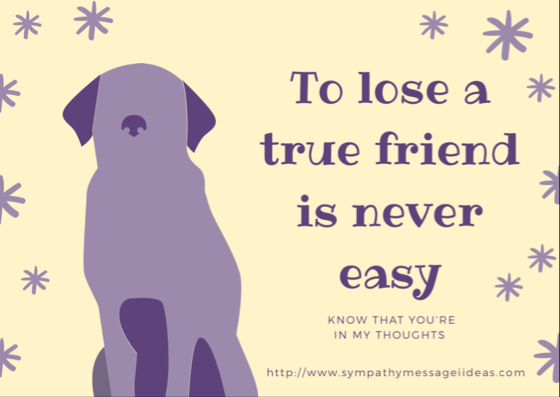 Tags Posts tagged with "pet sympathy messages"
Losing a pet can be just as hard as losing a friend of member of the family. They become incredibly special to their owners, and the loss will have a long and deep affect on them. 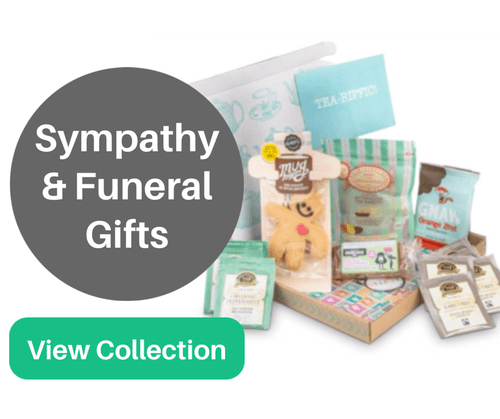 So when it happens, sending sympathy or pet condolence messages can be the most appropriate thing to do. However, finding the right words can be difficult. Especially when you are trying to judge the impact the loss has had on their lives. 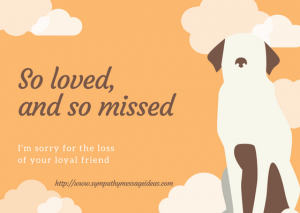 If you are struggling then you may want to use the pet condolence and sympathy messages below to either give you a guide and some ideas of what to write, or pick the most fitting one and use it in your pet sympathy card. Our pets never really leave us. They live on in memories ofthe love and devotion they gave us. Our treasured friends bless our lives and give us more love than we ever knew possible. May fond memories of __________ bring peace and comfort to you. 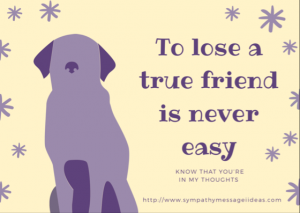 To lose a true friend is never easy. Know that you’re in our/my thoughts. At first they need us, and then we need them. Wishing you comfort and peace during this difficult time. The heart remembers most what it has loved best. May fond memories comfort you and bring you peace. It’s hard to say goodbye to such a special companion. Of all the words used to describe _________, there is truly only one – Irreplaceable. May fond memories of your beloved pet warm your heart always. Although no words can help to ease the loss you bear, just know that you are very close in every thought and prayer. 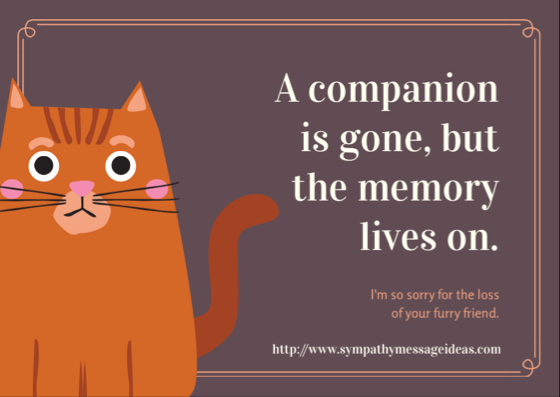 Treasured friends like your furry companion are missed by all when they pass on, and their fond memories live on forever in our hearts. Wishing you comfort and peace in your time of need. I know words do little to ease the pain you feel when such a lovely pet passes on. Keep the memories close to your heart and know that I’m keeping you in mine. 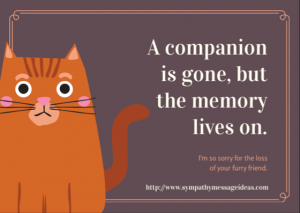 I’m deeply sorry to hear about the loss of your friend and pet. They were certainly a gift from above. I am so sorry for your loss. 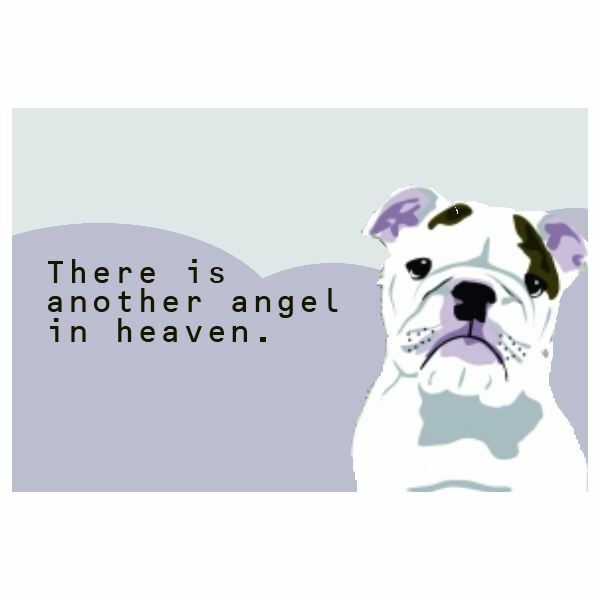 Life is short, and the loss of a pet serves to remind us of how precious our time here truly is. I’m sorry to hear about the loss of such a wonderful pet.